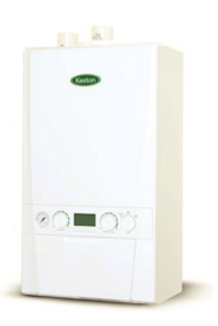 The Kenston S30 is a system gas boiler with an output of 30kW. It is B rated and has an efficiency rating of 89.6%. This boiler is an easy to install compact boiler with its height of 700mm, width of 395mm and depth of 278mm. It comes with a 50mm muPVC solvent weld flue as well as push & clip spigot connections to help with the quick install. The S30 has an easy to see pressure gauge and large backlit display with easy to use controls. As well as this it comes with weather compensator to keep control of your house's temperature. This boiler also comes with inbuilt frost protection to protect your boiler from any weather that's thrown its way. The S30 can be placed just about anywhere! It comes with a 27m twin flue to help with flexibility as to where it can be placed. As a compact boiler it's able to fit in a standard size cupboard. This boiler comes with a fully modulating digital display with simple diagnostics. It has a low component count to maximize the reliability of the boiler. As well as this, it comes with 2 years warranty.